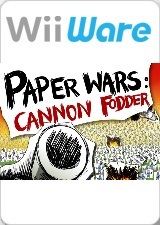 Paper Wars: Cannon Fodder is a tower defense video game developed by several Polish and Hungarian outsourced programmers of iFun4all team, in the cheapest way you can imagine. What's the so-called brilliant goal of the game? You would never guess. It is about destroying all enemies! The same well-known thrilling story, hordes of cold-blooded enemies trying to survive the Armageddon! There are some additional goals to be achieved in different missions and levels - watch your right! The game can be played by up to four players in co-op mode. If you think you need some extraordinary power-ups, you can get them during three campaigns: Classic, Winter Assault and Cyber Wars. 'Hand made' graphics, soviet style military music and annoying sound effects make players eager to complete each level and collect medals for their outstanding efforts. The graph below charts the compatibility with Paper Wars: Cannon Fodder since Dolphin's 2.0 release, listing revisions only where a compatibility change occurred.